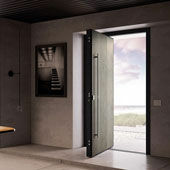 Di.Big is the brand’s latest pivoting, armoured door, designed with great attention to detail and a refined aesthetic. Presented at Made expo 2019, Di.Big is available in several finishes, formed by three vertical sections, especially designed for an elegant aesthetic, suitable for any decor. This style has a pivot opening and a single front flush to the frame, the frame is in sheet metal, the counter-frame is in zinc steel, the pivot hinges are adjustable on three axes, the security lock has a European cylinder and double deviators with a lateral closure mechanism. Di.Big is assembled in three different ways: standard, flush to either the internal or external frame. The image shows a version in a Laminam finish.